Patriot has decades of experience in creating and administering solutions to complex workers' compensation risk management challenges. Through its subsidiaries, Guarantee Insurance Company and Patriot Underwriters, Inc. they produce, underwrite and administer alternative market and traditional workers' compensation insurance plans for insurance companies, segregated cell captives and reinsurers. 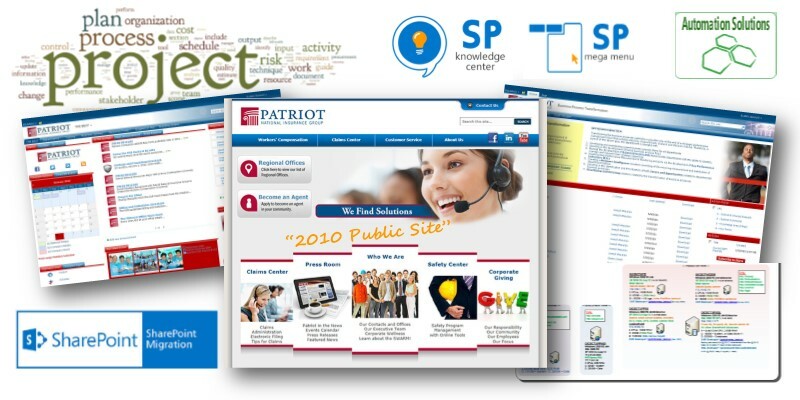 Rapid growth outpaced Patriot's internal systems for efficient coordination. Insurance Agreements were being tracked by a very complex Excel spreadsheet, and it was hard to keep track of where in the process the agreement was and to make sure that all the approvals and documents had been gathered. Additionally, forms were hard to fill out, and then all the information needed to be reentered into the complex agreement, which introduced potential mistakes, and therefore required additional proofing. We built an InfoPath form with tabs for each logical process section. It allowed for saving as a draft, and also had calculations, validation, and a final validation step. SharePoint Designer Workflows moved these agreements through the creation and approval process. The end result was automatically generating MS Word documents from custom Word templates with fields populated from SharePoint data. Custom content types and metadata were used heavily, and SSRS reporting was also used for tracking. As often happens, just digging into solving this problem focused attention on the process and reduced 20% of the work as some processes were revealed to be redundant. After the solution was deployed it saved about 50% overall process time. A SharePoint Managed Services agreement was made after this project to provide ongoing support. They now have a highly customized form that includes all the required fields for the agreement, and the form calculates accurately and has a final validation to verify that all data has been filled out in the form. An Online approval process that enables staff to see where in the process the form is. Automated word document generation for the final agreement that minimizes the chance of error due to re-keying information. Dashboards to show document status at any phase. Document management to track versions and keep documents all in one location related to the agreement. During the process of documenting the process, inefficiencies were discovered and the whole workflow process was simplified because of the project. Reporting that can be run at any time for tracking volume, dollars, type of agreements, etc. As one of the oldest providers of SharePoint consulting services, we understand that as the world becomes more and more digital, forms need to be digital too. With our third-party partner, Infowise, we can remake forms in SharePoint quickly and easily. If you'd like to know more contact us today!